GetMSIProductCode is a little tool, that retrieves very easily the product-code-property from a msi-file. This is a need of system-engineers, who deal with installer-files and often need this property. GetMSIProductCode comes in two small programs - You would only need one of them. The first show a small window into which You can drag a msi-file. It shows then the product-code and copies it into the clipboard. The second installs itself into the explorer´s context-menu for msi-files. 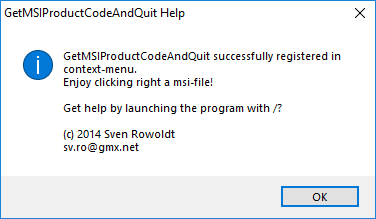 When You right-click on an msi-file and choose ´Get ProuctCode´, the product-code will be copied into the clipboard. Very cool! GetMSIProductCode comes in two little programs. Unzip them into a directory of Your choice. GetMSIProductCode.exe needs no installation. It is used by dragging a msi-file on it or started with a doubleclick. After dragging a msi-file ont this window it shows the product-code and put it into the clipbpard. 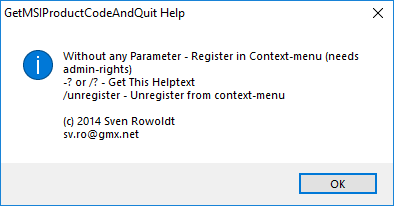 To remove the context-menu for GetMSIProductCodeAndQuit, start GetMSIProductCodeAndQuit.exe with the argument /unregister. 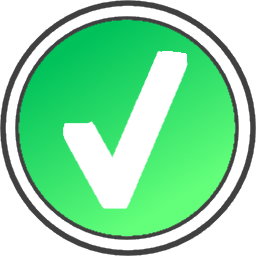 Just write a comment, report a bug, get help or suggest a feature. If you like this software I would be very happy, if you donate something, to buy me a beer.